For your congregation to effectively move forward, how many spiritual and strategic priorities should you have? Three? Five? Seven? How many priorities are too few? How many are too many? 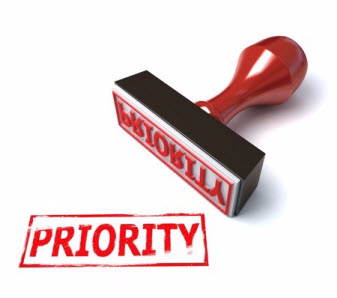 Did you know the word priority only existed in a singular form for the first five hundred years after it came into common use? It was primarily after World War II that it was expressed in a plural form and became priorities? If that is the case then the correct answer to how many spiritual and strategic priorities a congregation should have is one. If you could only have one priority as a congregation, what should it be? To reach people for a Christ-centered, faith-based spiritual journey? To pay off the debt for your buildings? To connect the unchurched with your church for Christian discipleship? To grow your church bigger? To make disciples of Christ who make disciples of Christ? To make sure your church exists until you die? To call a pastor who will bring vision that your church can follow? To reach young adult families with children? To fill up your sanctuary with worshippers? To care for the spiritual, physical, and emotional needs of your members? If you could choose only one, which one would you choose? Which one is a worthy priority that fits your congregation and honors our God? As I begin my service as associational director of missions with the Columbia Metro Baptist Association, I pray for discernment of what ought to be the priority of our association. I realize it is not up to me to determine the priority. Spiritually it is up to God. In terms of ownership is it up to the congregations affiliated with our association. Yet, I can share a draft of a priority and encourage feedback for deeper discernment, ownership, and molding of our one priority. Eventually that may lead to the point where we are ready to be captured by God’s empowering vision. Here goes. Our One Priority is, to start and strengthen congregations to serve as vital and vibrant missional communities. If you want it in a longer version that provides more details, here it is: Our One Priority is, to start and strength congregational expressions in a manner that empowers them to serve as vital and vibrant missional communities who reach and nurture the lost, unchurched, underchurched, and dechurched people who live or visit in our associational fellowship area, or who live wherever in God’s world our congregations are sent and received. As you think about the various words in this statement and say, “What does that mean?”, here are a few definitions for you to ponder. Congregational Expressions: Various forms and types of churches. Some are traditional, some innovative, some experimental, and some are on the very edge of Christian ministry reaching hard to reach people groups. Vital and Vibrant Missional Communities: Congregations focused on the essential elements of the mission of our Triune God, and with great passion and enthusiasm that evidences God’s empowering vision for their congregation. Lost: Those without Jesus Christ as their personal Lord and Savior. They are not currently walking with Jesus in their life. Unchurched: Christians without a current active involvement in a congregation. Either they have never connected with a congregation, or they are in transition and need a connection with a congregation. Underchurched: People who have drifted in their relationship to a congregation, and are not plugged in deeply or regularly enough that they are growing and maturing as disciples. Dechurched: These are also known as the Dones because they have intentionally rejected any participation in a congregation. Sent and Received: Congregations—and their leaders and dedicated disciples—respond to God’s call to be sent to places who need a Christian witness or support for the witness currently being expressed. The goal is that the witness of these congregations will be received by those who are being sent. What would you affirm about Our One Priority? What would you challenge? What would you change to strengthen it?